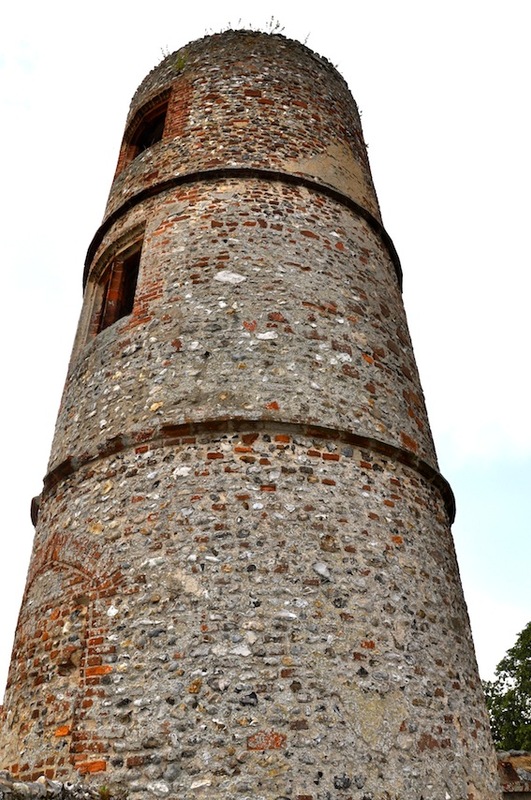 While exploring the churchyard of St John’s Church in Stiffkey, Norfolk, I found something that I was not expecting, an Elizabethan tower. 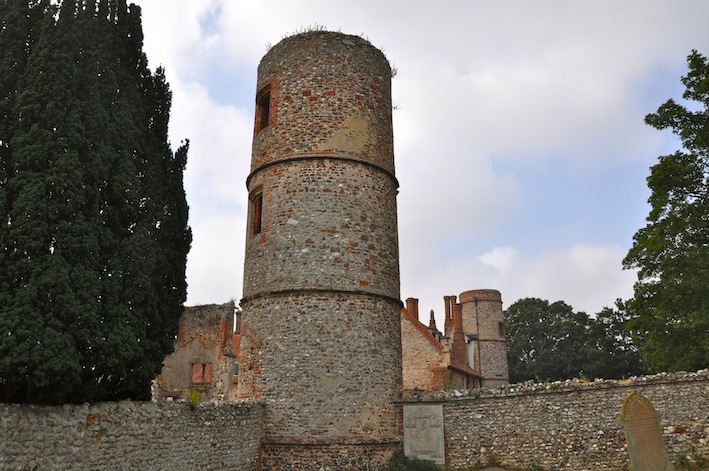 Standing in the south west corner of the churchyard set in walls that surround two sides of the churchyard, a very large tower in brick and flint. As first I didn’t see the house and the other towers, its only when I stood back I saw part of the house. Not being all that tall, husband came in handy for reaching over the wall to take some more photos. I was amazed when I saw the photos, history was oozing over the wall from the other side and there was no way that I could get to it. So I have had to make do with my photos and some investigation work………but oh to have had a peek. 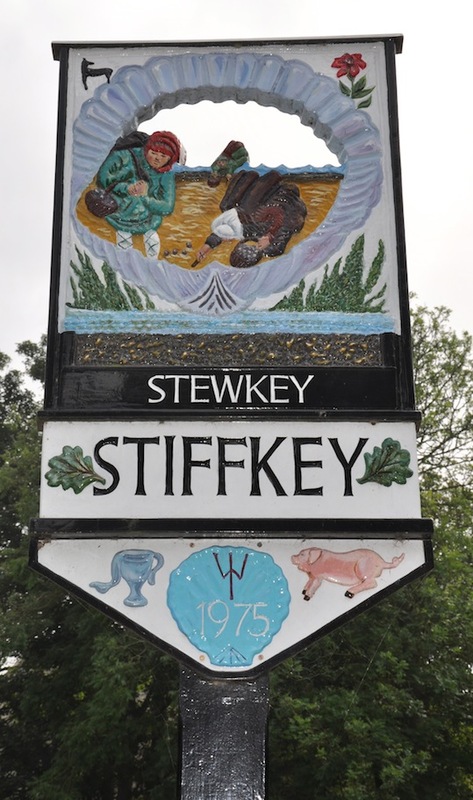 Some details of my amazing find……The tower that started it all off, is part of an original Elizabethan layout of Stiffkey Old Hall. 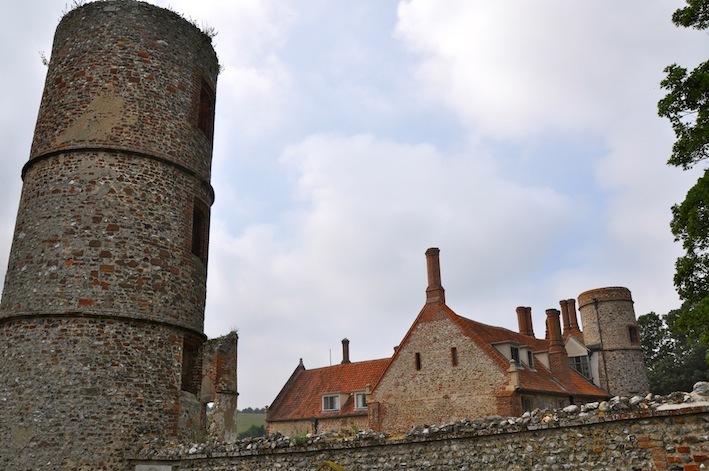 The original building was began by Sir Nicholas Bacon, Lord Keeper to Queen Elizabeth 1 and completed by his son Nathaniel, a prominent figure in county government and knighted in 1604. 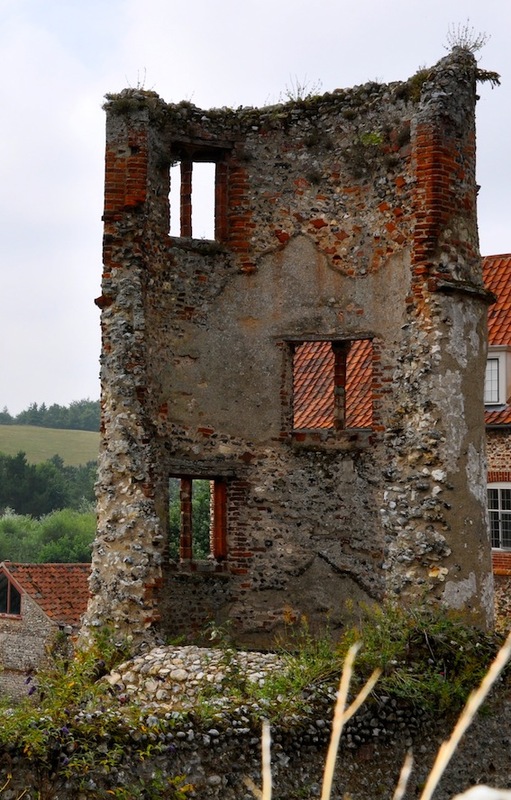 The Old Hall is a three-towered, three storey building of brick and flint, with stone dressing and a pantile roof. 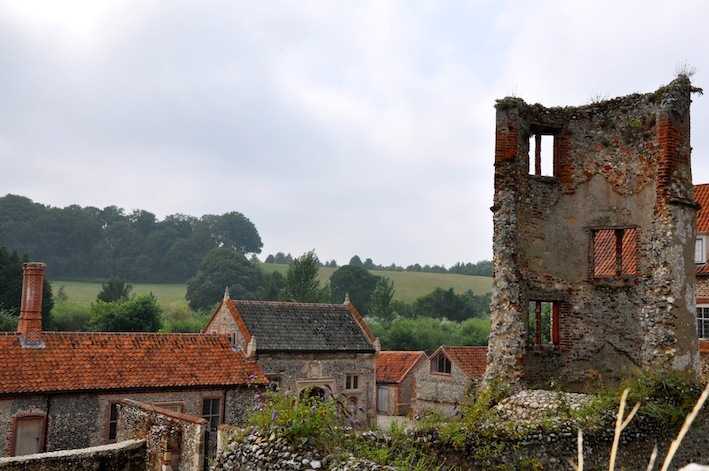 It represents the remains of a u-planned house, originally to have a courtyard with eight turrets, but when Sir Nicholas died he left only £200 to complete the building. The Old Hall ended up as a house with wings, 6 turrets and a detached gatehouse. Demolition to its present size occurred during the mid 18th century, leaving the west range, half of the north range and three of the towers. 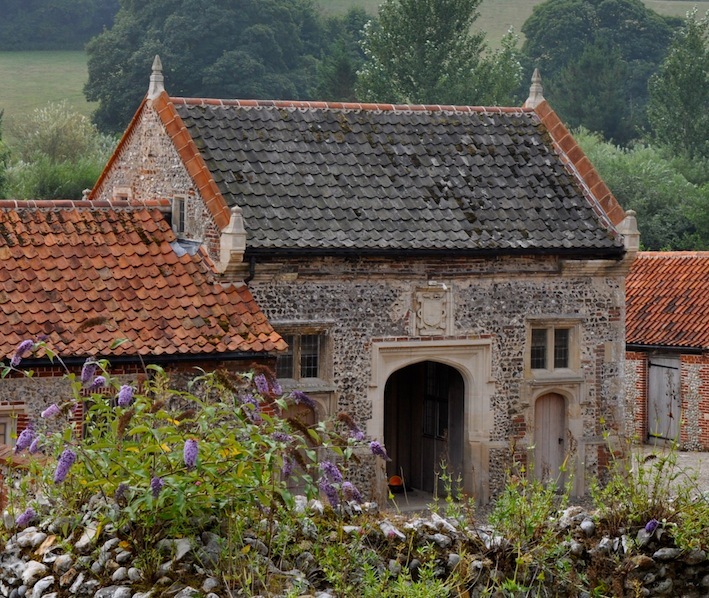 On the south side of the courtyard is a detached flint and brick entrance gatehouse or lodge, dated 1604. At the east end of the north wing are the ruinous remains of the great hall now a sunken garden. There are wonderful gardens but unfortunately we didn’t take any photos as we didn’t know the gardens were there. 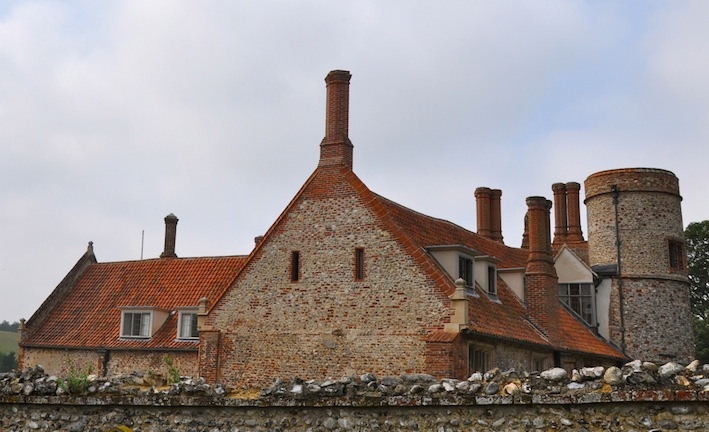 After the death of Nathaniel, the Hall pasted to his grandson Sir Rogar Townsend who lived in the Hall while his great house and gardens were being built at Raynham in Norfolk. The Old Hall therefore became part of the Raynham Estate, the house was partly demolished and the land let to tenant farmers. In 1779 a sketch was made of the Hall showing it to be in a half ruinous state. Following this some repairs were made to the Hall and during the following years the Old Hall went through many tenants. Then luck change when the Hall came into the hands of a wealthy bushiness man Lewis Cafferate. Lewis with his wife Dorothy restored the Hall and created the sunken garden and fishpond in the ruins of the great hall. In 1953 the house and grounds were in excellent order. Although in 1978 the house and grounds were once again fallen into disrepair. The house was left to Randle and Ann Feildin, who subdivided it into self contained units for other members of their family. But I have found a reference from 2008 that the Old Hall was currently the subject of a large program of restoration and reconstruction by the current owners. It would be wonderful if they ever thought to open it to the public, because I for one would love to have a walk through its history. What a find – if only you could go and have a proper look around, it’s oozing atmosphere – you can feel it from the pictures. I am an independent researcher and author of the cross-disciplinary online resource, The Landed Families of Britain and Ireland (http://landedfamilies.blogspot.co.uk). I am currently writing a piece for my site on the Bacon family and their country houses, and would very much like to reproduce your view of the gatehouse at Stiffkey Old Hall as an illustration to my piece. My project is strictly not for profit, and I should be happy to provide a credit to you and a link to your site. Would that be OK? I have had a look at your site, so interesting. I am quite happy for you to use the photo and a credit and link would be nice. I shall have a longer look later, I would love to delve more into the history of some of the houses that I photograph, but no time at the moment, maybe later. Found the church and this hall today, Feb 2019. Appreciated this research you have done. Would love to see the garden in summer.